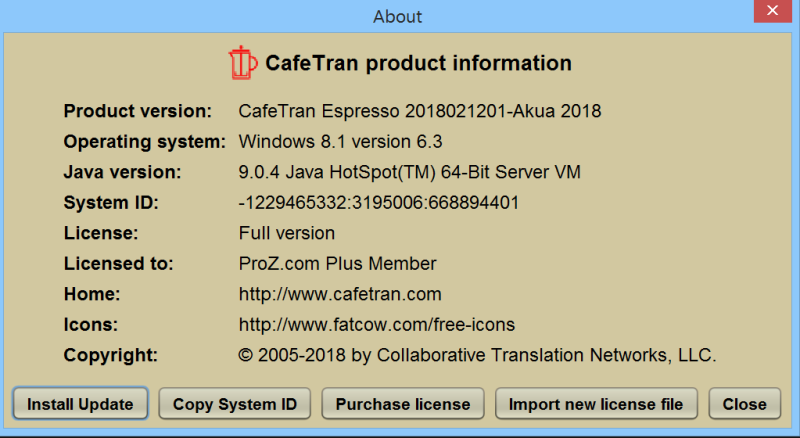 Hi, I updated Java today to version 8 update 161 (build 1.8.0-161-b12) and CafeTran crashed several times since then. The the message "Java(TM) Platform SE binary has stopped working. A problem caused the program to stop working correctly. Windows will close the problem ..." pops up. I am a translator, not a tech guy and hope someone can offer a solution that does not require digging into the guts of my computer. Make sure to install the new CafeTran Espresso 2018 in a separate folder, to isolate it from your old one. Also, make sure to click the correct icon to launch the new version, instead of the old one. Note that you will need to update your license, because of the new installation path. Do some tests with CafeTran Espresso 2018. If the new installation is stable, I could give you some instructions to copy the user files from your old installation to the new one. But that's the part where it starts to get geeky. Update: I just tested the procedure above on a HP Pavilion with Windows 10 Home. I made sure to add '2018' to the suggested installation path, to separate it from the older version of CafeTran Espresso. I have the same problem and this fix worked for me, thanks! If you want to save your customer dictionaries, abbreviation lists, text shortcuts etc.